Do you have SVT and are miserable, wishing there was something that you could do to help yourself? Are you upset that you have to go on medication or have ablation? Yes, if you have SVT, you have an accessory pathway present, but why do you have electrical mis-fires on some days vs others? Why does SVT seem to occur more frequently when you are stressed, didn’t get enough sleep, are dehydrated or overate? Why do so many people with SVT also have POTS, anxiety, and adrenal fatigue? I struggled with SVT and horrible SVT related anxiety for years. I was afraid to have ablation and didn’t want to go on medication. I learned how to use DIET, Self-care and Lifestyle modifications to avoid SVT by learning about SVT triggers and the real ROOT causes of my SVT. Today I share this information with people from all over the world and create resources to help you take a natural approach. 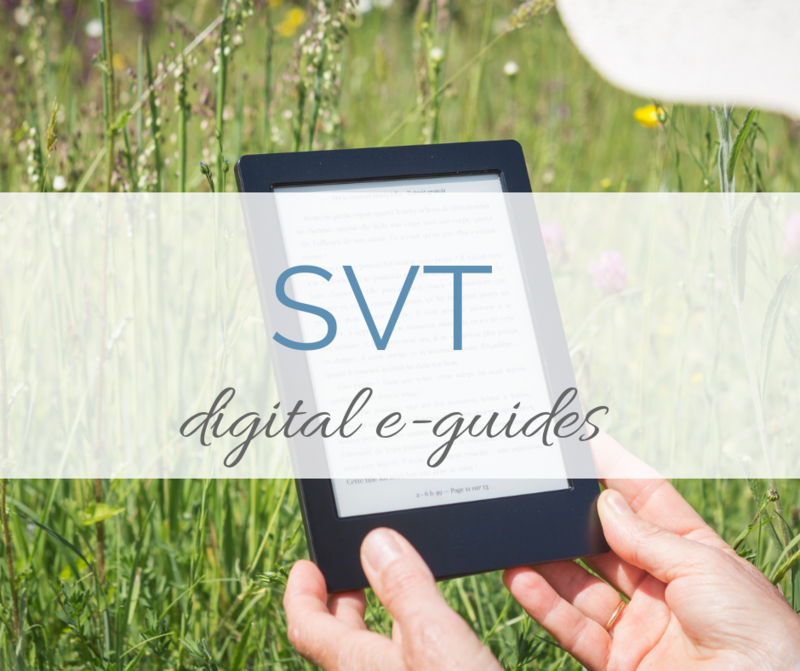 is a FREE 14 page digital download e-guide that gives you my basic steps to get started avoiding SVT immediately. 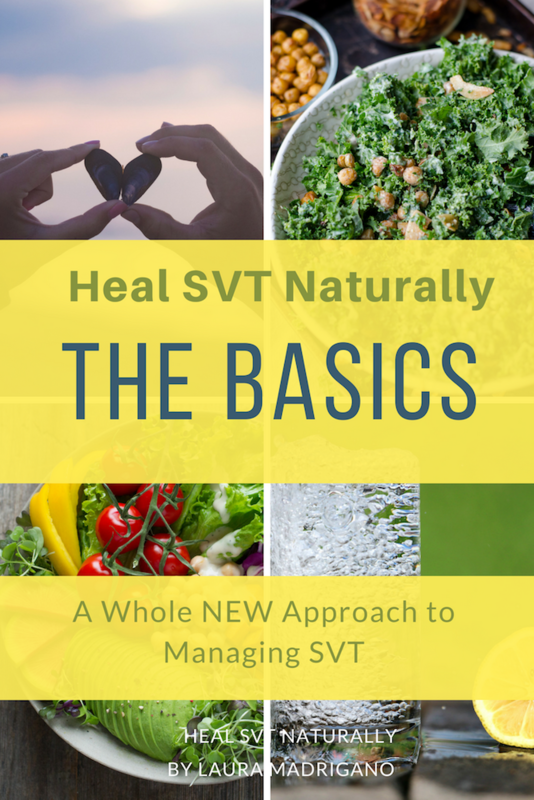 This is a FREE e-guide that I send to you when you sign up for the Heal SVT Naturally Newsletter. To get it click below! Is INTEGRATIVE. 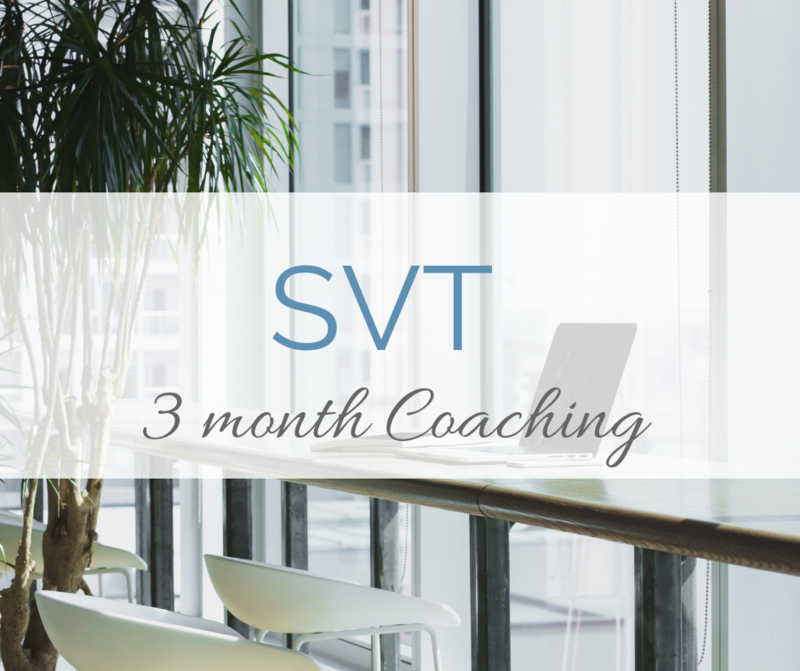 It views SVT as a WHOLE body condition to help you learn from it, understand why you have it and what you can do about it. It offers the missing treatment options in the traditional way of viewing and treating SVT and gives you dietary and lifestyle strategies to incorporate into your healing plan. It explains how diet, gut health, hormone balance, undiagnosed food sensitivities, stress, emotions, mineral balance, and lifestyle choices are triggering your SVT. It gets to the heart of the matter and helps you learn about the underlying ROOT causes of the condition and gives you actual STEPS that you can do to help yourself. It helps you use the law of attraction to stop HATING your SVT and shift your mindset to attract what you really want, which is health and healing. It defines the CORE FOUR healing layers. The Physical + Nutritional, Emotional, Spiritual and Energetic reasons why you have SVT. Identifies SVT Triggers and explains what to do about them. Learn the Root Causes of your SVT and how to use Integrative Treatment Options like diet, identifying food sensitivities, and listening to your heart to help yourself. After struggling for over 15 years, I dove into my own healing. I went back to school to study nutrition, and became a Board Certified Coach and an Integrative Nutrition Health Coach. 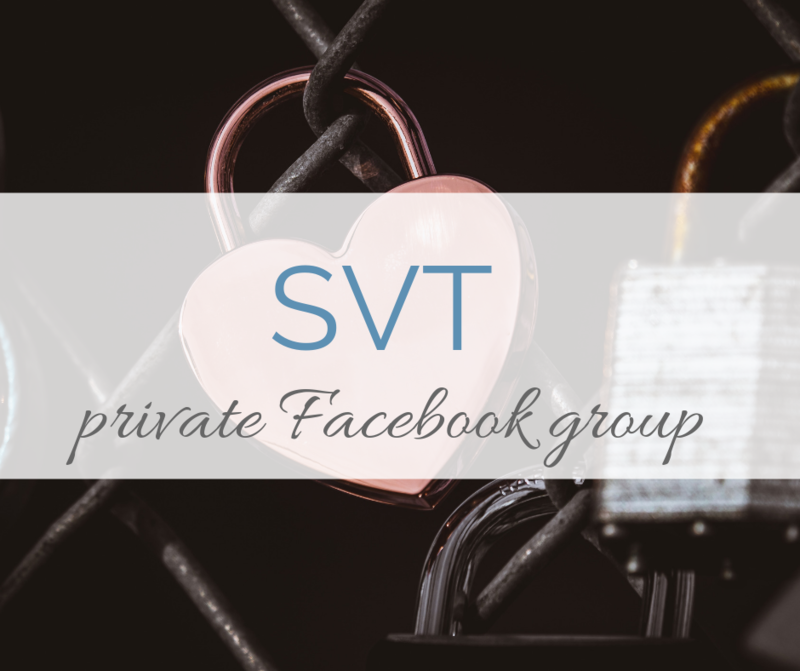 Join 1700+ people in the Heal SVT Naturally peer support group. Search any topic and get four years worth of valuable information. Meet people from all over the world. New! Starting April 2019. Longing for ongoing support and direction? Want help with your specific case? Wish you could afford an Integrative Nutrition Health Coach? 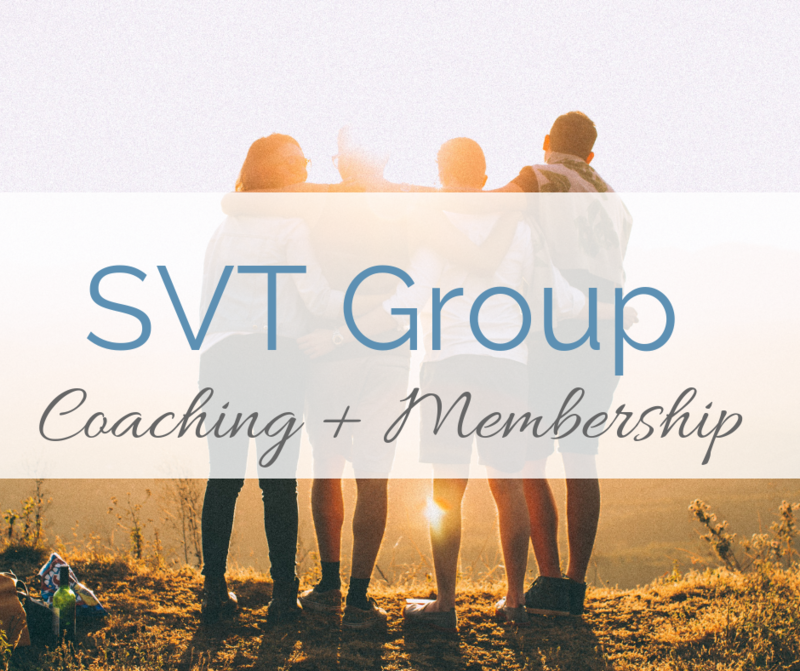 This affordable group coaching and membership program will support you with the CORE FOUR healing changes to help rid your of SVT! 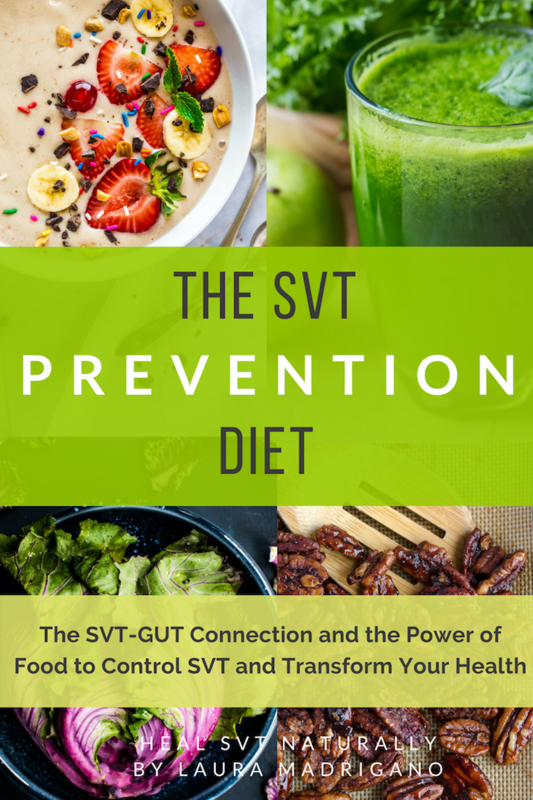 Start with my FREE 14 page e-guide: The TOP TEN TIPS to Heal SVT Naturally..
Do you have digestive issues and are making the same SVT-Gut connections that I started to make? Help you do more than just suppress the symptoms SVT is presenting and really get to the bottom of why this is happening to you. Learn what to eat and what to avoid for SVT prevention. My Heal SVT Naturally Approach applies integrative logic to your circumstances. It addresses acute episodes with trigger management, prevention, better nutrition, less depletion, and more attention to self-care while simultaneously searching for the deeper causes of the vulnerability and addressing those, such as removing foods that are making you sick and inflammed and improving gut health and vitamin and mineral absorption. It then layers in important therapies like vagal toning, stress management, and listening to your heart for a more complete approach. I believe that all health issues are multi-layered conditions. I provide you with self-healing tools to guide your efforts into all the right places. 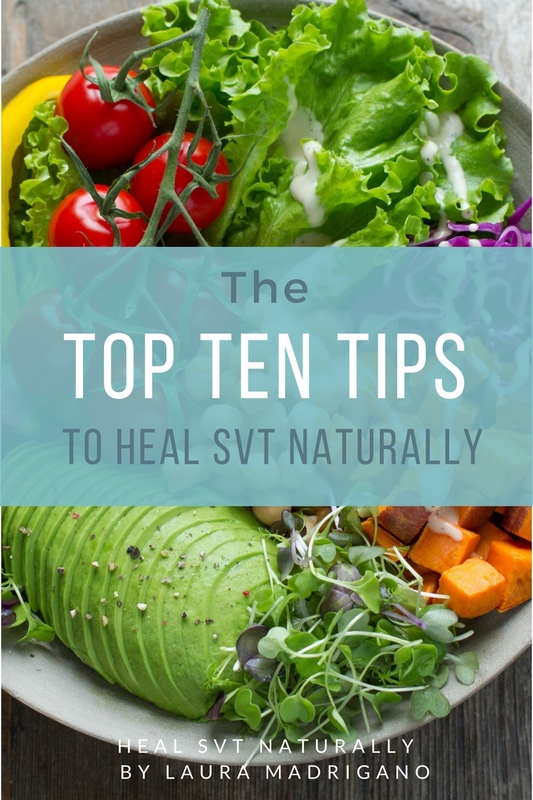 When you sign up for my Heal SVT naturally newsletter, you will receive the Top Ten Tips to Heal SVT naturally immediately. Plus you will get all of the latest information emailed to you once a month. I am a Mom to 2 young boys, an Integrative Nutrition Health Coach, a Board Certified Life Coach, and I healed my SVT naturally. I help people learn the ROOT causes of SVT and learn to use DIET, and Lifestyle modifications to help them reduce and manage SVT. Today, I create tools like e-guides, articles, and group coaching resources to educate and empower you to do the same.